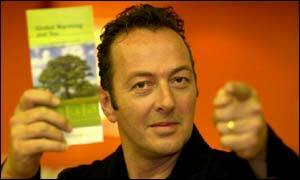 Fans of the late Clash frontman Joe Strummer are being asked to donate a tree to a project to grow a forest in his memory. Environmental group Future Forests is planting the Joe Strummer Memorial Forest on the Isle of Skye to mark his contribution to getting the organisation started. Strummer, who died of a heart attack shortly before Christmas, at the age of 50, was a great supporter of environmental causes. The musician, whose songs have been credited with bringing politics to the punk rock generation of the late seventies, had aimed to become the world's first "Carbon Neutral" artist. He decided to have his own forest planted to offset the carbon dioxide emissions from the production of his CDs and his tours. "Joe absolutely loved forests and trees and helped get Future Forests started," said a spokesman for the group. "His inspiration and energy backstage at Glastonbury 1996 was the spark that got Future Forests going." "Joe said 'bands must be contributing to global warming by their buses, equipment trucks and the diesel used to power the stages. Can you imagine how much CO2 the pressing and the distribution of a CD creates? What shall we do about it?'." Other acts who have joined the campaign have included Pink Floyd, Coldplay, Pulp, David Gray and Mel C.
"This is all a legacy to Joe Strummer," the spokesman added. The forest will be planted at Orbost on the shores of Loch Bracadale, on the isle of Skye, off Scotland's west coast. It will eventually provide a home to hundreds of species of wildlife, including otters, red deer and foxes. People can pay for trees to be planted via the Future Forests website. In return, they will receive a certificate and a map of the forest.